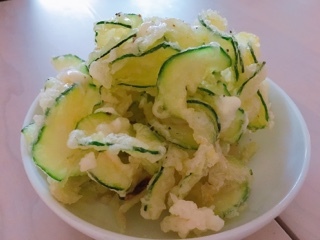 Forget the floral ceiling, at Figo, the truly popular centerpiece is the blooming bowl of zucchini fritti ($11) that sits a top every table. In fact, there must be one chef whose sole function is to constantly produce these gorgeous intricately appetizers as it was mere moments between placing our order and receiving a bowl. Despite looking wispy and delicate the fritti requires at least two utensils to break part the crispy batter holding everything together. While still savoury, it incorporates a sweet element from the honey. 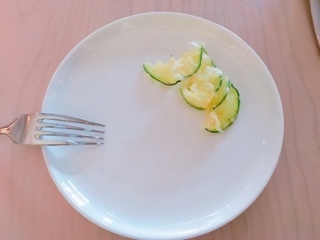 I would have liked the lemon creama fesca (a lemon ricotta) to be stronger as the dish was pretty greasy and heavy (even split amongst three); a robust dose of citrus could help lighten the fritti. 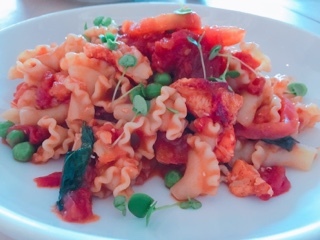 The floral themed meal continued with the lobster gigli ($26), the lasagna type pasta sculpted into tulips – great for scooping the thick tomato sauce and sweet peas. With pops of basil the gigli remained light and tasty. Thankfully, there were adequate chunks of lobster so you could actually taste the seafood and I enjoyed that they kept the sauce light (rather than relying on a cognac cream sauce that seems to follow the crustacean so often). Figo is undeniably pretty … so pretty and girly that I’d love to see a table of cowboys sitting around digging into the frilly dishes. It’s an elegant and airy open space, swathed in such neutral tones that I’m sure a number of weddings will be held in the central Toronto restaurant. It’s a lovely place to meet up for a chat with the girls – but, alas, I doubt that’s where we’ll meet those cowboys.